If we are connected via social media, then this is probably old news. But, I am so excited that it deserves its own blog post. It is a pleasure and honor to announce that I have been added to the 2015 Wilderness Systems and Bending Branches pro-staff teams. 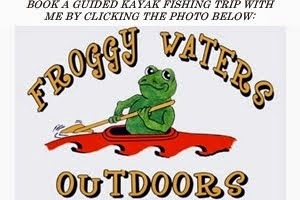 I am excited to be an ambassador for these brands, as well as represent kayak fishing in New England. They are both innovative industry leaders with top notch products and, most importantly, great people. A few folks have already asked, "well how do you get on teams like Wildy and Bending Branches?". There is no simple answer. It is a combination of working hard, paying your dues, becoming an expert in fishing and paddling, networking, marketing yourself and your skillset, representing the gear you use in a professional manner, and finding a way to stand out above the crowd. It is isn't easy. My road, like that of many others, was filled with ups and downs. There will be hard times and times when you get knocked down. You will make mistakes. You will probably make a poor decision or two. We all do. The difference is how you respond. I've always tried to use my failures and poor choices to make myself a better person. Learn from your mistakes. Pay attention to details. Ignore those who don't support you. Come back stronger and smarter. Being successful in the kayak fishing industry is not different than being successful in life, although success has very different meanings for different people. OK, speech over. Head over and check out the Wilderness Systems - Community. There, you'll find all things Widly Fishing, including reviews, videos, articles, team bios, and much more. Last week, my first addition to the fleet arrived, in the form of the 2015 WS Ride 115X Max Angler in camo. It is 11'6" long, 33" wide, and has a ton of features, including the Phase 3 AirPro Max seat, a removable console for electronics, and numerous angler add-ons. The seat alone could sell this boat. Even stuck inside on the warehouse floor, the seat feels fantastic. I'll be adding another boat in April - the brand new ATAK. Most of the details of the ATAK haven't been released publically, but I can tell you it is going to be one sick boat. Not only are the base features going to perfect for any type of angler, the add-ons and extras that you can use to trick this boat out are impressive, to say the least. Widly pro Jeff Little recently released an article that talks about the prototype process that went into the ATAK. It also has a couple "sneak peak" pics of the prototype boat. Wilderness is also releasing a series of ATAK photos on their Instragram account using the #wildyfishing tag, so you can see more of the final model there. Bending Branches also has a great website, which includes details of all of their paddles. I've used a few different models in the past, and recently received my new Angler Pro in the mail. It is extremely light and has a great ferrule system that extends between 230cm and 245cm. There is also a larger ferrule that extends from 240cm to 255cm. However, I prefer a shorter paddle for river use, even from a high seat position. They will also be offering it in a RealTree camo pattern in a few months. As I said on Facebook, it will make a redneck heart skip a beat. BB is also hoping to offer the RealTree pattern on the entire angler series within the next year. Head on over to the Bending Branches website and spend some time looking around. 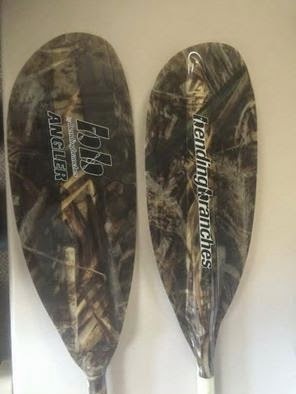 Beyond the angler series, they have some sweet paddles, including the popular Navigator - a wood paddle. You can also check out the team bios, including yours truly. Now I just have to wait, impatiently, for the ice to melt and rivers to clear. In the meantime, I'll be blogging, preparing some seminars, and prepping gear. My first seminar is March 14th-15th at the LL Bean National Fishing Expo, which will take place at their flagship store in Freeport, Maine. I really hope to be part of a group that can accelerate the growth of kayak fishing in New England, and hopefully attract some bigger tournaments and more local outfitters to the region. If you are a reader and have any kayak fishing questions or would like to hit the water, don't hesitate to contact me via email (drew@manpoweredfishing.com).